Almost all warriors, from the highest to the lowest carried a single edged knife known as a scramseax. Indeed, it seems that wearing a knife may have actually been a symbol of freemanship (the spelling varies, with scramseaxe or scramaseaxe, with an 'e' or an extra 'a' or not is rather arbitrary as were the Saxons were with their spelling). Although primarily an everyday tool, in battle it could be used to finish off a felled opponent, and in the case of some ceorls, a mid to large sized scramaseaxe could have taken the place of a sword. Although it contained much the same amount of iron to make as a sword, the scramaseaxe was an easier weapon to make with only one sharp edge and a thick reverse edge. Examples found have both just plain iron blades or pattern welded ones as well as inlaid blades. The pattern welded versions would have taken weeks to make depending upon their length, in which time an ordinary sword could have been made. Its length varied according to its role, and examples found range from 7.5 - 75cm (3" - 30") blade length. However the average size for most of the hundreds of examples found is around 15 - 25cm (6"-10") . They are divided into two general size ranges. The smaller examples range from about 7.5 - 35cm (3" - 14") in blade length, and this is probably the knife referred to as the hadseax. These small examples were almost certainly just everyday tools: butchery knives, woodworking tools, eating knife, etc.. There are also a few very long examples whose blade lengths are in the 54 - 75cm (22" - 30") range. These larger knives are certainly weapons rather than tools, and were referred to as a langseax. Most blades were broad, heavy and with an angled back sloping in a straight line towards the point and this is the typical Saxon style. The Scandinavian style had a more curving back and the Frankish style a more curving blade. Blades were often inlaid with gold, silver, copper or bronze wire beaten into fine channels carved into the iron blade. The grip was of wood, bone or antler and was sometimes carved or decorated. The hilt was usually without a pommel or crossguard, whilst the tang went all the way through the smaller seax handles and was clenched over at the end of the grip. The lack of a pommel or crossguard was probably because a scramseax was never actually meant as a 'fencing' weapon, and was more for stabbing and hacking. Scramseaxes were always carried in a sheath of folded leather sewn down the blunt side of the blade, which was often decorated. It is unlikely that a small scramaseax could kill a heavily padded or mailed man, probably just serving to irritate him. It's main employment was probably as an eating and all-purpose 'pocket' knife. The blunt reverse edge of the seax could be used as a hammer to break bones to extract the marrow, or even hammered through materials via it's blunt back as a sharp wedge. It also gives a lot of strength to the whole knife. The langseax, a tool much more suited for fighting with, usually ended in a deadly needle point, therefore a thrust could have had much the same effect as a spear. A slashing blow to an armoured man would do little visible damage directly through mail, certainly breaking bones and causing heavy bruising; but brought down on an unarmoured limb or neck would prove to be fatal. The simple rule of 'the bigger the weapon, the greater the damage' reflects how dangerous Scramaseaxes could be. 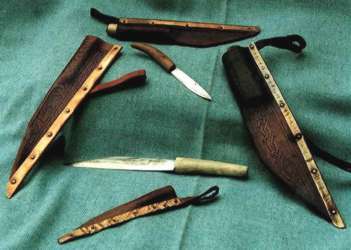 Knives of the period arrived in many more shapes and sizes according to their intended use, especially as craft tools. Blades looking disconcertingly like modern penknives , except with long tangs. Double ended blades that swivelled into the handle, with a 'long' blade at one end and a short one at the other. These are considered to be craft tools, with the short blade used for very delicate work so that your hand is close to the subject, and the longer one for more general work. The secret to the operation of these blades is that the opposite end locked up against a pin as you bore down on the blade you were using. Some examples have more than just a double sided bone handle, and have a folded frame of iron either side of the blade. This type even fold into the iron sheet frame much as penknives do today. Many knife blades demonstrate the length of time people must have held onto them, as the blades have been sharpened over and over again. So much so that the blades are little more than spikes. They are reminiscent of scalpels, and could be just that, but there are too many of them, and the possible reason for their survival is that as they were sharpened so profusely losing the harder steel cutting edge, they were put down and forgotten, then lost by the original owner and finally turning up in the archaeological record. What this does demonstrate for certain is how long they worked their blades before switching to a new one or having it reforged. Last updated 28 March, 2005. Article by Ben Levick 1991, Roland Williamson 1999.